First Aid/AED/CPR Training Registration - Ardent Solutions, Inc.
Ardent Solutions is a proud American Health and Safety Institute Training Center, providing CPR, AED, and Basic First Aid combination training. CPR, AED, and Basic First Aid combination training helps develop basic first aid knowledge, skills, and the confidence to respond; and is an excellent choice for both the community and workplace setting, and is consistent with recommendations of the 2010 National First Aid Science Advisory Board and OSHA’s best practices for first aid training programs in the workplace. Training course is perfect for individuals who require or desire CPR, AED and First Aid Knowledge and Skills. Excellent opportunity for businesses, bus drivers, adult residential care personnel, personal care aides, informal caregivers, faith-leaders, or anyone wishing to help others in an emergency. Help the Allegany County Community Wellness Committee in meeting our goal of training 100 community members to be better prepared to save lives due to heart complications. Space is limited. Register today! April's Cuba Library Class Is Full! Ardent Solutions is pleased to support local businesses, schools, and healthcare facilities by offering on-site CPR/AED/First Aid training. Training is available upon your request to meet your scheduling needs. To learn more or to schedule your class today, complete the Contact Form below. Sponsored in part by the Allegany County United Way! 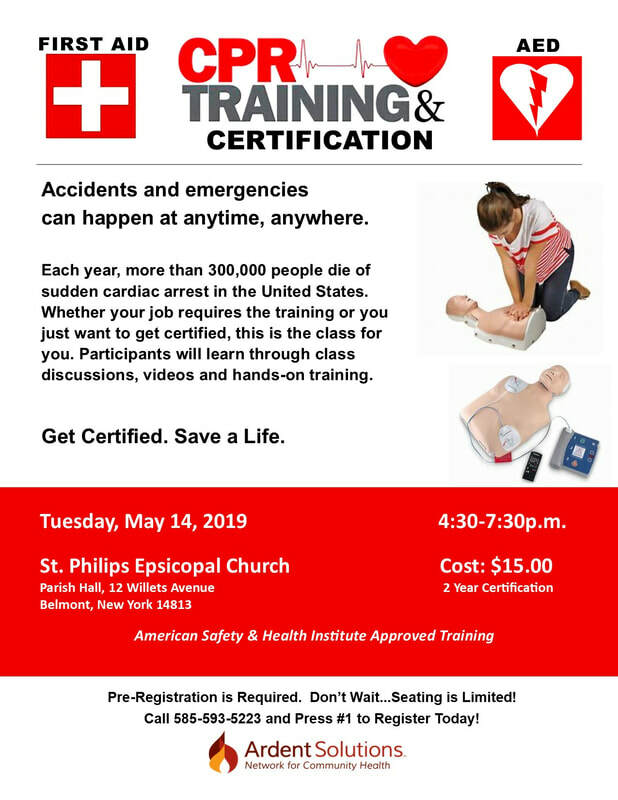 For further information about Ardent Solutions' CPR/AED/First Aid Training, please contact Patty Amidon at 585-593-5223, ext. 1010.